The Strategic Latin America Fund has rather small net assets of $29.18 million. Its objective is to provide income and long term capital growth. The expense ratio of this fund is 1.74% per year. It shares a small amount of dividend yield of 0.49% which is paid on annual basis. It is currently managed by Heiner Skaliks. 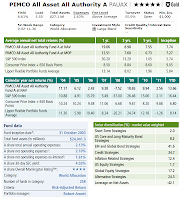 This top performer world allocation mutual fund has YTD return of 19.48%. Last year (2011), the performance of the fund was -11.70%. Based on the load adjusted returns, it has returned 15.13% over the past 1-year. 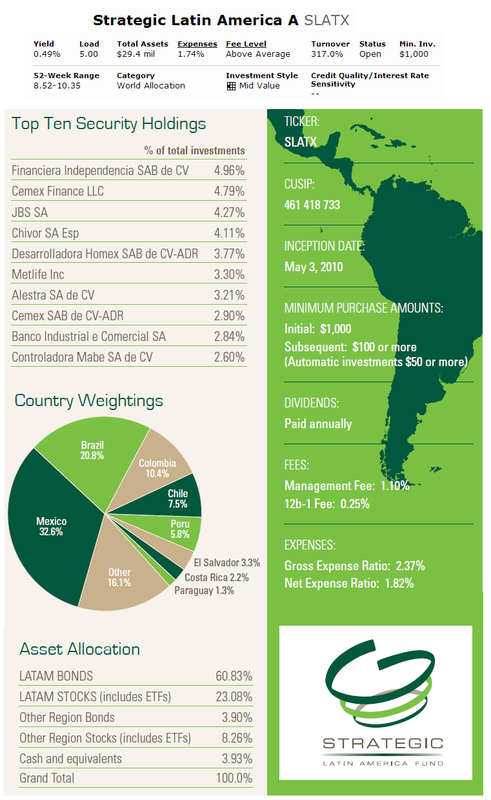 As per the 2012 third quarter report, the top holdings of this fund are Financiea Independencia SAB de CV (4.96%), Cemex Finance LLC (4.79%), JBS SA (4.27%), Chivor SA Esp (4.11%), Desarrolladora Homex SAB de CV-ADR (3.77%) and Metlife Inc (3.30%). The top 2 countries are Mexico (32.6%) and Brazil (20.8%). This VGLSX fund is sub-advised by Franklin Advisers Inc/ Templeton Investment Counsel. The management team is Hasenstab, Nori and Motyl. Morningstar rated this fund with 5-stars rating. It has $444.26 million of total net assets. It also has low expense ratio of 0.67%. The fund distributes 4.40% 12-month dividend yield. The CUSIP of this fund is 91915R665. The largest holdings as per September 2012 are Russia-Foreign Bond (1.68%), Nota Do Tesouro Nacional (1.44%), Korea Treasury Bond (1.41%) and Swedish Government (1.31%). The top industry allocations are 24.48% in United States, 9.55% in United Kingdom and 7.46% in Republic of Korea. As part of PIMCO fund, the PIMCO All Asset All Authority fund has total net assets of $27.10 billion. The mutual fund utilizes its assets to purchase other PIMCO funds which invest in stocks or bonds. It also has a high dividend yield of 6.61%. This yield is distributed quarterly. The annual holdings turnover as of December 6, 2012 is 55.00%. It also has annual expense ratio of 0.68%. Robert D. Arnott is the current fund manager. The fund’s shares price is $11.40 (12/16/2012). Morningstar analysts rank this fund with Gold and 5-stars rating for its performance. It has YTD return of 16.11%. The best 1-year total return was in 2009 with 18.65% and the only year it has negative return was in 2008 with -7.54%. The fund has returned 9.65% over the past 1-year and 6.16% over the past 5-year. The benchmarks are S&P 500 Index, Consumer Price Index +650 Basis Points and Lipper Flexible Portfolio Funds Average. The effective duration of the fund is 4.77 years and effective maturity is 7.80 years. The top sector diversification based on market value weighted are 41.6% in EM and Global Bond Strategies, 34.7% in Credit Strategies, 24.3% in Alternative Strategies, 17.2% in Global Equity Strategies and 12.4% in Inflation Related Strategies. Templeton Global Balanced Fund aim is to provide income and capital appreciation. Christoper F. Molumphy is the fund manager since 2005. The class A was introduced in September 2011. This balanced fund has total net assets of $1.09 billion. It shares 5.60% dividend yield with the recent distribution of $0.03 in September 2012. Morningstar analysts rated this fund with 3-stars rating. 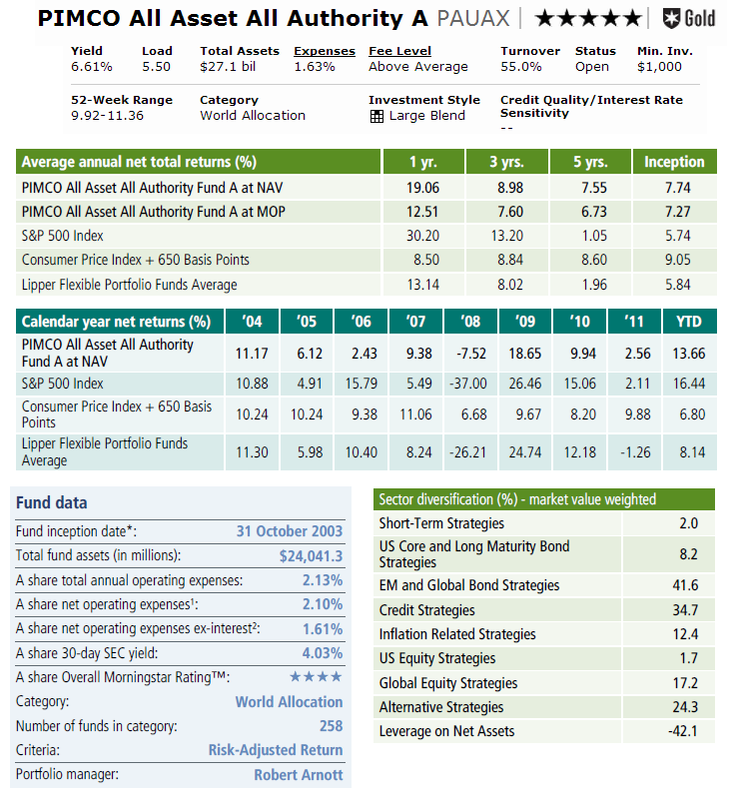 The best performing world allocation mutual fund has year-to-date return of 16.03% and 5-year annualized return of 3.08%. Based on the load adjusted returns, it has returned 1.87% over the past 5-year and 7.77% over the past 1-year. As of October 2012, the top bond holdings are Nota Do Tesouro Nacional (2.17%), Government of Indonesia (1.29%), Government of Ireland (1.26%) and Government of Mexico (1.19%). Top 5 equity holdings are Comcast Corp (2.02%), Sanofi (1.50%), Kingfisher PLC (1.46%), CVS Caremark Corp (1.42%) and HSBC Holdings PLC (1.36%). 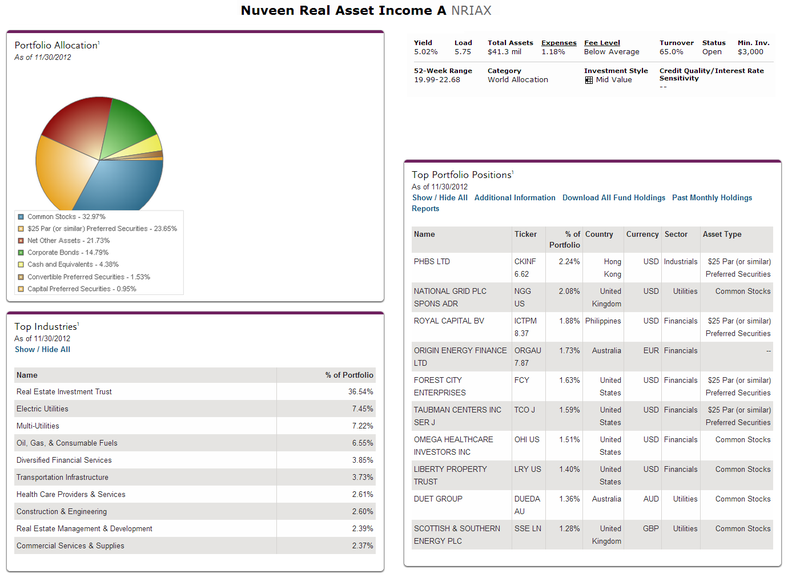 Nuveen Real Asset Income fund uses its assets to buy securities issued by real asset related companies that are generating income. It will invest in both equity securities and debt securities. Jeffrey Schmitz, Jay Rosenberg and John Wenker are the fund managers. It has total net assets of $37.26 million. This fund has just been introduced to public in September 2011. Hence it is new, there is no Morningstar rating yet. The dividend yield is 5.03%. It also has 1.18% annual expense ratio. The fund’s NAV is $22.27. The fund has year to date return of 16.02%. It has returned 9.26% over the past 1-year. The fund is on the 3rd rank in the category. There is a 0.25% management fee and 5.75% front end sales load fee for investing in this fund. As per November 2012, the top portfolio positions are PHBS Ltd (2.24%), National Grid PLC SPONS ADR (2.08%), Royal Capital BV (1.88%), Origin Energy Finance Ltd (1.73%) and Forest City Enterprises (1.63%). The top industries are Real Estate Investment Trust (36.54%), Electric Utilities (7.45%) and Multi-Utilities (7.22%).